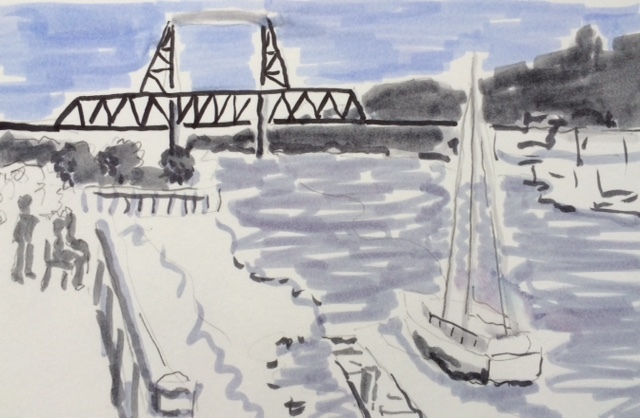 With encouraging weather in the forecast, I took a road trip south to join Urban Sketchers of Tacoma for their third anniversary sketch outing on Saturday, June 4, 2016. 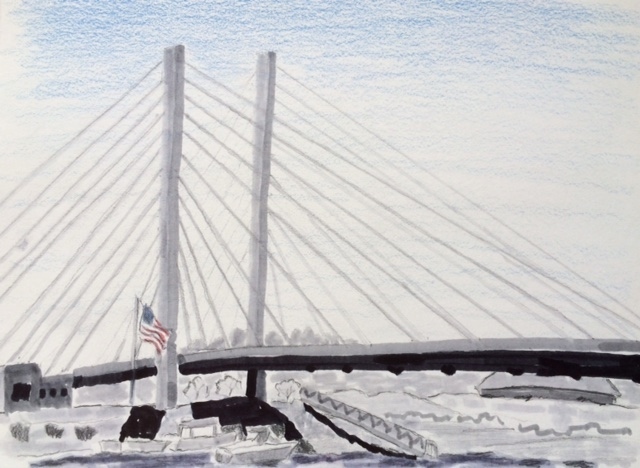 I was excited they were meeting at the Museum of Glass because I knew I wanted to draw the bridge next to the museum. I thought it might have a jazzy name, Hightower or Stretch comes to mind, but, according to an online website it’s called the East 21st Street Suspension Bridge. It was a very warm day so I found a spot of deep shade under a small tree and focused on the prize. Brilliant sunlight spotlighted the bridge creating masses of dark shadows. I could see boats tethered contentedly beneath the bridge and the Tacoma Dome through the arc of the span. An American flag fluttered crisply in the breeze. I give Tacoma bragging rights for their urban waterfront splendor. A grand staircase descends to a wide-open public space in front of the contemporary Museum of Glass. Fountains and promenades parallel the waterfront where boats of all sizes dock with a marina. My favorite bridge is to the right and a rustic trestle bridge is to the left. Tacoma Narrows, another picturesque suspension bridge located to the northwest, links the city to Kitsap Peninsula. After the meet-up, as I crossed the glowing Dale Chihuly Bridge of Glass overpass that connects the Museum of Glass to the cultural corridor of Tacoma, I had fun pondering bridge symbolism in a city ringed with distinctive bridges. I also experienced appreciation for the artists and designers who created the dynamic public spaces in downtown Tacoma. Wonderful post, Kathleen! I'm going to share it to the 4th Annual West Coast Sketch Crawl page! It provides good motivation for those thinking of attending.